Chalkstorm - E3 Hands Free with Johnny Dawes! Warmest greetings SuperTopoists from a cold but sunny day in the UK! Here's a New Years offering of a wee video about the original and inimitable Stone Monkey, Johnny Dawes and his attempt to try a hands free "walk" up a classic gritstone climb called Chalkstorm. 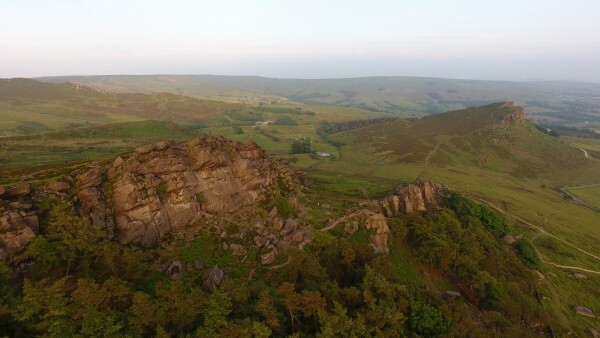 For a normal trad ascent the climb is graded E3 5c, about 5.10 or so in US money, and the route is located at the beautiful venue called the Roaches in the Peak District. 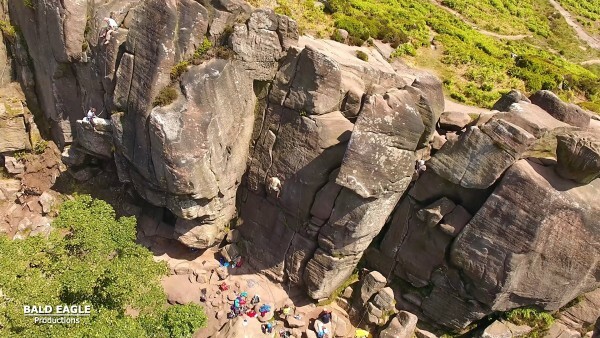 Featuring aerial footage of one of the greatest gritstone crags with one of the UK's greatest ever climbers so sit back and marvel at some jedi balance, ninja footwork and magician movement! All constructive feedback welcome, please feel free to share and hopefully it will brighten up your day accompanied with a brew and biscuit! I wonder who created the video. Did I remember to tell that this punter & I had a strange non-meeting of the minds years ago on the way to a "High-Tea"? I'm sure I took the time the last time to give it a good effort. It strikes me he'd strike me if I said it within his reach. all good . . .
Great form! I was expecting some belly-slithering shenanigans (which still would have been impressive), but I was blown away by this. I don't think anything above his knees ever touched the rock. Fun. No-hands boulder problems have been around forever. I recall Eckenstein mentions them in Great Britain in the 1890s. 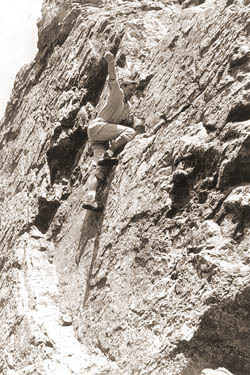 On climbs, Bob Williams and I made the first no-hands ascents of the Needle in Estes Park in the 1960s (no top rope)- Scary - but only 5.0 to 5.4, depending on who you ask. Nowhere near the difficulty of Johnny's ascent. Dawes is a quirky inspiration, as always! Heya Gnome thanks for taking the time to post as always and that Guardian vid with Johnny is ace and well worth a look! Out of curiosity, why is the area called the Roaches? I knew Johhny had great balance, but wow...he looked like he was strolling to his local to have a pint with the lads! And E3 5C is more like 5:11a than 5:10. Ps thanks for the grade correction! Baldie, do you have to sign that nutter out of his home? Bloody ‘ell, like an E3 isn’t hard enough? That said, if you keep at this you stand evens of making me a believer in drones. Hey Reilly actually both of us are only let out of the cuckoo's nest on very special occasions by Nurse Ratched after medication time! Awesome. I've only been to the grit once about 30 yrs. ago (Stanage and Millstone). They are amazing crags. Dawes is an interested dude. Fascinated by physical movement. Footwork is the soul of climbing. Haha... Chalkstorm without hands. Just rename the route: Walk-in-the-park. Sick balance and high steps. Johnny's center of gravity is now so close to the ground that it's close to cheating... When do walking end up being crawling?